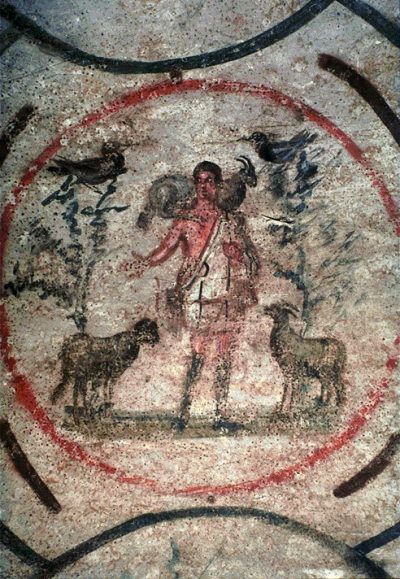 The Good Shepherd, Catacomb of Priscilla, 3rd-4th c.
As the Twelve return from their first missionary journey in today’s Gospel, our readings continue to reflect on the authority and mission of the Church. Jeremiah says in the First Reading that Israel’s leaders, through godlessness and fanciful teachings, had misled and scattered God’s people. He promises God will send a shepherd, a king and son of David, to gather the lost sheep and appoint for them new shepherds (see Ezekiel 34:23). The crowd gathering on the green grass (see Mark 6:39) in today’s Gospel is the start of the remnant that Jeremiah promised would be brought back to the meadow of Israel. The people seem to sense that Jesus is the Lord, the good shepherd (see John 10:11), the king they’ve been waiting for (see Hosea 3:1–5). Jesus is moved to pity, seeing them as sheep without a shepherd. This phrase was used by Moses to describe Israel’s need for a shepherd to succeed him (see Numbers 27:17). And as Moses appointed Joshua, Jesus appointed the Twelve to continue shepherding His people on earth. Jesus had said there were other sheep who did not belong to Israel’s fold, but would hear His voice and be joined to the one flock of the one shepherd (see John 10:16). In God’s plan, the Church is to seek out first the lost sheep of the house of Israel, and then to bring all nations into the fold (see Acts 13:36; Romans 1:16). Paul, too, in today’s Epistle, sees the Church as a new creation, in which those nations who were once far off from God are joined as “one new person” with the children of Israel. As we sing in today’s Psalm, through the Church, the Lord, our good shepherd, still leads people to the verdant pastures of the kingdom, to the restful waters of baptism; He still anoints with the oil of confirmation, and spreads the Eucharistic table before all people, filling their cups to overflowing.